For the moment let us assume that you have selected and are buying good coffee. Coffee that it is reasonably fresh and sourced from a roaster who knows his trade. Coffee that has been over-roasted is usually quite easily noticed, look for a bean that is very carbonised in that it crushes easily into black dust. This will quite often be particularly dark and oily. An occasional bean with an oily surface is acceptable in an Italian or very dark roast but this should not show on the entire batch. Be aware however that there is an element of bitterness in most coffee. The caffeine content itself has a bitter taste to it which, when combined with some delicate acidity, which we are looking for, creates a bitter taste. There are also chemical reactions that take place during the roasting process – these build up the (welcome) antioxidants and yes, also help to create an element of bitterness. The beauty of a good coffee is in the balance between this slight bitterness, a little acidity or “puckering,” and of course the underlying sweetness. Arabica beans show less evidence of bitterness than do the Robusta bean. We do not use Robusta in our coffees but this bean is regulalry used where a lower cost option is demanded. 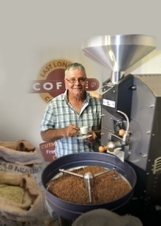 Some roasters put forward a case for a Robusta content of up to 10% but this remains a matter of some debate. If you are managing your own extraction as one might in a restaurant style espresso machine, there is a good chance that you are over extracting. This takes place if too much water passes over the coffee while in the porta-filter. As a general rule, if one either pushes through more than 30ml, or 60ml for a double shot, the added water will extract unwanted bitter flavours from the coffee. I have even seen some barista’s pull double the shot while preparing an Americano instead of adding the hot water before or afterward. All they are doing is delivering a bitter-mess. The finer the grind, the more bitter the coffee. If, for example, you have a light hand when it comes to tamping, you might inadvertently set the grind size too small in order to pull your shot within the ideal range of between say 22 and 28 seconds. In doing so, you are preparing a more bitter coffee than you would have if you’d had the correct grind size along with a firmer tamp pressure. The acceptable tamp pressure should be around 13-20kg. Many writers refer to a 23 second shot and a 15 kg tamp as the ‘holy grail’ of barista law. Whatever works for you is fine, but I would excercise extreme caution if this is under 10kg, if you are experiencing bitter coffee and tamping lightly with a finer grind, this could be a possible cause. Heat essentially ‘over-cooks’ the coffee. Excess heat can come from many causes, the machine thermostat could be incorrectly set - the correct water temperature should be between 90 and 95 C.
Another cause might be if you leave your porta-filter in place while you prepare your milk. In addition to keeping the porta-filter hot, this also prevents your group head to cool between coffees. This sounds very basic I know but if used coffee has stuck to the group head for any reason (including the barista not purging properly) this coffee is then used again and this will essentially be the same as an over extraction.